Nov. 29 2012 will be a day forever remembered for a decision with severe consequence. The San Antonio Spurs were set to play the Miami Heat in a nationally televised game on TNT in a perennial Finals preview. However, a few hours before tip, Spurs coach Gregg Popovich decided to send stars Tim Duncan, Tony Parker, Manu Ginobili and Danny Green on a commercial flight home to rest up at the tail end of a 6-game road trip. At the time, I was up in arms, questioning the character and motive of the decision and was shocked to see the plethora of support behind Pop from experts in the industry. Supposedly this came down to an argument of “what is best for the team” vs. “what is best for the game”. Fast forward 4 months and that fateful day continues to spark controversy. In the March rematch, Heat coach Erik Spoelstra decided to sit stars Lebron James, Dwyane Wade and Mario Chalmers in Miami. Let’s recap the sequence of events and try to look into the ramifications that not only affected the teams involved, but the league, fans and ultimately the character of the game. – Popovich’s decision to sit his stars vs. the Heat was supposedly justified by the duration of their road trip. The truth is, the Spurs’ previous 2 games were cakewalk wins vs the Wizards (118-92) and Magic (110-89) where Duncan (23, 27) and Parker (22, 30) were already seeing limited minutes. – Accepting of the decision also came from the notion that this is what Popovich does year-to-year. While this may be true, it certainly doesn’t happen in November when the playoff race is still taking form. No one dares question (4-ring) Popovich’s resting techniques however if we look between the lines, has the strategy truly paid off in recent years during the supposed aging process? Since the 2007 Championship, the Spurs have yet to make it back to the Finals and on three occasions, have been ousted by the 2nd round. Clearly, endurance has not been the deciding factor. – Let’s call a spade a spade at the end of the day. Popovich a) didn’t want to show his cards against a potential Finals match-up and b) would not have pulled off stunt this stunt at a home game. Even he knows there is much backlash that would come from fans and realized he could get away with it in a road game. – For those supporting Popovich’s decision and ultimately agreeing that a coach can pull starters at his discretion, let me paint a picture… Christmas Day 2004: Shaquille O’Neal returns to LA as a member of the Heat to square off against Kobe Bryant on ABC. If then coach, Stan Van Gundy decided to bench Shaq for rest purposes in one of the most anticipated games of all-time, what would be the general consensus from the pro-Pop side? NBA schedules games with national television/sponsorship opportunities in a strategic manner. At some point, you have to realize that you are part of a larger enterprise. The league is in the business of making money and each team needs to understand their role in supporting this initiative as “what is best of the league” ultimately pays dividends for everyone involved. – The decision also lead to Popovich/club being fined a hefty sum of $250,000. – Outside of the business aspect, let’s look at this from a fan’s perspective. Tim Duncan was scheduled to play in Miami a total of one game in the entire season. Not only were potential fans denied this opportunity, the opposing stars were removed from the game completely, thereby eliminating any potential fan interaction. As an adult, I can try to understand Pop’s decision from a holistic standpoint, however if you were to explain this to your kids, how can you preach the notion that taking days off from work at will is acceptable in the grander scheme of things? – We also saw a cat-and-mouse game play out from Erik Spoelstra’s end when the Heat coach benched superstars, Lebron James and Dwyane Wade in the rematch in San Antonio. Given Spoelstra’s previous claim that resting his stars was only going to be considered in the last week of the season, this move had the all the stench of retaliation. One has to question if resting the stars would even have been considered had the Heat still been riding their win streak. Lebron had played 72/72 games leading up to this match. In the end, the fans once again suffer as Lebron’s sole visit to San Antonio this season was taken away (clearly an anticipated game where average ticket prices were close to $140). – With the Heat stars bench, the Spurs actually had a chance to gain ground for overall home court advantage however they came out lethargic after halftime and could not close out the Heat down the strech, leading to a Miami win (sans Lebron and Wade). This no doubt has to leave a stinger on Popovich if his potential group of champions cannot put away a depleted East contender at home without three of their starters. There are too many losers in this circle of events: the fans, the league, television networks, potential sponsors, and evidently the Spurs. 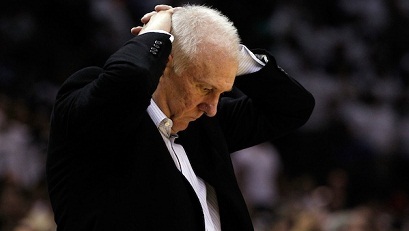 Once the dust settles, I hope Popovich takes some time to rethink the decision and ask himself, was it worth it? This entry was posted in Sports and tagged NBA. Bookmark the permalink. Both comments and trackbacks are currently closed.